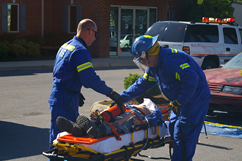 At Washington County – Johnson City EMS, we are committed to providing the most advanced patient care for both emergency and non-emergency medical transports. Our focus is on providing compassionate care focusing on the patient and families needs. As the region’s largest EMS service, WC-JC EMS provides emergency care and transport to patients during what are most often the most stressful and perilous times in their lives. We are committed to being there for you in your time of need. The Washington County – Johnson City EMS Billing Department is dedicated to helping our patients work through the arduous process of filing insurance, determining co-pays, and working through the payment process. WC-JC EMS strives to maintain fiscal responsibility to the citizens of Washington County, Johnson City, and Jonesborough while providing the highest level of care we can. We are here to help you with any questions you may have with your bill or the payment process. You can contact our billing department at: 423-975-5500 or submit a question online.